Versailles Survives Mistakes, Miracles, And Mystery To Return To Final Four…. In a grinding, grueling, and something-less-than-perfect performance when perfection would have helped…the Versailles Tigers survived a furious finish to best Marion Pleasant and capture the Div. III regional volleyball title. Kettering, OH – It was anything but textbook. And truth be known, the Versailles Tigers were far from as good as they would have liked to have been in Saturday’s Division III regional final at Trent Arena. Truth be known, they came out a bit tight, tense, and tentative against an athletic Marion Pleasant team that prides itself on making opponents work – for taking advantage of every crack in their exterior. 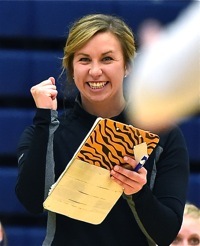 Truth be known, the Tigers committed enough mistakes in serving, hitting balls out of bounds, balls into the net, and mistakes in communication to send them home on an average day…and home in three, at that. 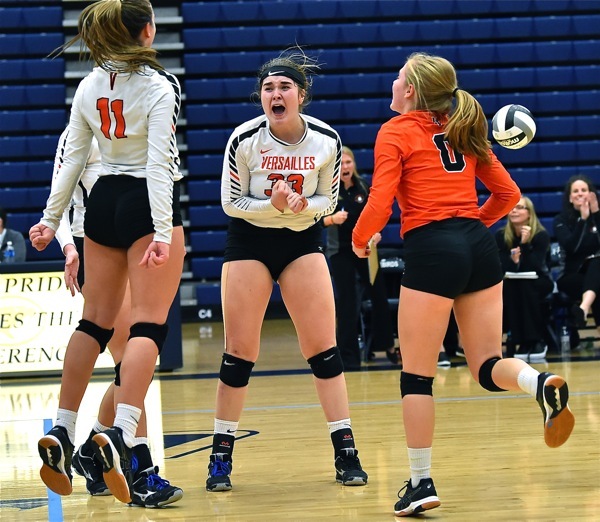 But the mystery, or even miracle of this regional final is that they overcame it all – yessir, they beat the rap…and the mistakes, too, to come back in four sets and beat Marion Pleasant, 18-25, 25-17, 30-28, and 27-25, to win their second consecutive regional title and advance for a second year to the state Final Four next week at Wright State’s Nutter Center. The miracle part was the matter of them overcoming a horrible start – an obvious case of first game jitters that saw Marion get comfortable, confident, and aggressive at the net, blocking one Versailles kill attempt after another, shots that kept dropping harmlessly at the Tigers’ feet, and just inside the net. To compound things…serves into the net, shots that landed five feet behind the end line, and routine attempts to put the ball back over the net to extend a rally that somehow ended up in the net, or under it. 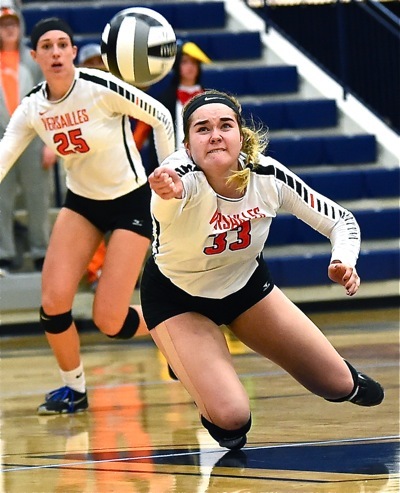 To Pleasant’s credit, they make the most of those mistakes, scoring on quick sets at the net where hitters Laina Sansotta and Alissa Holler were dropping bombs in the middle of a helpless defense. When it ended, at 25-16, the Tigers looked tired and flustered as they gathered about coach Kenzie Bruggeman to regroup. Kelsey Custenborder saves a point in the first set, but she may have saved something bigger with her attention to matters in the fourth. But regroup they did, as the match became a game of streaks. Versailles, with renewed energy came out in the second set and promptly went on an 8-1 run that saw them open up a 18-11 advantage, and eventually win 25-17. Then Pleasant came back in the pivotal third set with an 8-2 run of their own that saw the game tied at 23-23, then 25-25, and back and forth…and tied at 28-28 before Versailles scored the 29th point on a disputed call, then finished it to win 30-28. Along the way they lost sophomore Emma George, who was hustling all over the court, to an ankle injury. George never returned to action, but the Tigers carried on despite her loss. 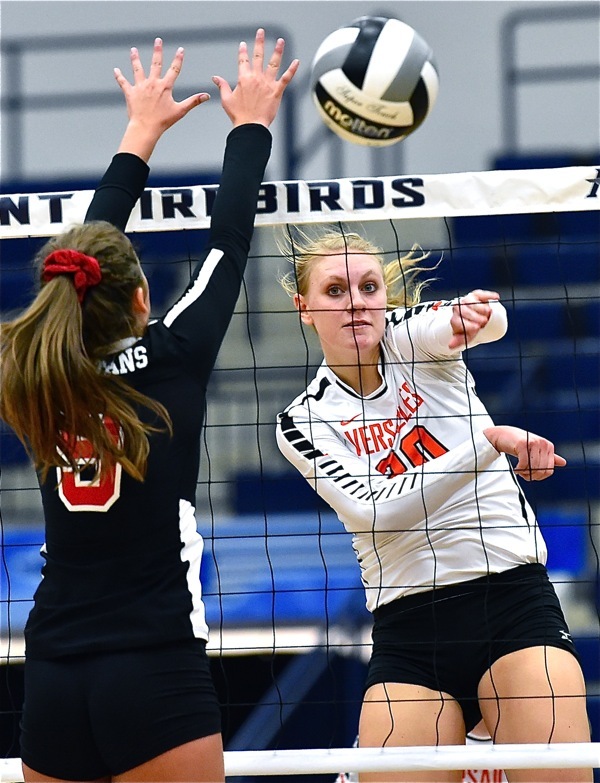 Pleasant, as mentioned, is an athletic group, seasoned and extremely well-coached to take advantage of an opponent’s letdown; and it appeared that the 30-28 win in the third set did give Versailles cause for a temporary letdown. They came out in the fourth set and promptly gave Marion the first four points, and fell behind by as many as six as Pleasant kept rallies alive until a Versailles mistake at the net would allow them a quick set kill. Bruggeman called a pair of timeouts, and they apparently worked. Point by point the Tigers worked the deficit to four, to three, two, and finally tied the game at 14-14, whereupon it became a matter of smaller streaks, and survival. One got the sense that if Pleasant could win, and carry that momentum into a fifth set, the match would surely be theirs. But senior Liz Ording, God bless her, took matters into her own hands. Bigger than the moment throughout the match, Ording had been a steadying influence on her nervous teammates, talking them through things while delivering one thunderous point after another at the net. 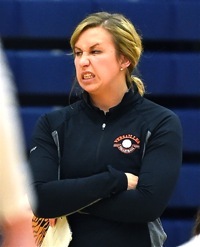 She grew even bigger in the third, when she delivered a pair of big kills to give Versailles an 18-16 lead, forcing Pleasant to call a timeout. Pleasant’s Morgan Haas watches to see if a Lindsey Winner shot in the third set is in, or out. The Spartans came back out and tied it at 20-20. Versailles crept back ahead with a couple of points, 24-22. Pleasant came right back to tie it again at 24, then 25. But at 25-25 junior Lindsey Winner got a room service set from teammate Kelsey Custenborder at the net, and crushed it through the heart of the Pleasant defense, but it went long – a foot beyond the court, apparently. 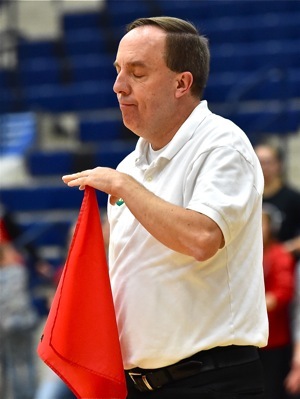 Except…line judge Keith Cooley, on the opposite end of the court (the Versailles end) quietly motioned that the ball had been tipped by a Spartan player. The ‘up’ official on the stand signaled the ball long, and gave the point to Pleasant. But Kelsey Custenborder had seen Cooley signal ‘tipped ball’, and called attention to it. With all eyes on Cooley now, he quietly motioned that he had called a tipped ball, and the point should given to Versailles. A mystery call, if you will. People in orange and black erupted with the Tigers’ bench. People in black and red (Pleasant colors) erupted, too, but at Cooley, who calmly kept his hand on the top of his flag, the signal for a tipped ball. It gave Versailles the lead, 26-25, but it had a demoralizing effect on Pleasant. On the very next serve Versailles put the ball away for match point, and the Tigers had their regional title, mystery call and all. And things going bad during a stressful point of the fourth set. A classy gesture, to be sure, and a wonderful example to his team, and to the adults alike, of grace and character in a stressful moment. “What a match,” said Versailles’ Bruggeman, who gave all the credit she could muster to Haas and his grace over the way the game ended. Custenborder, who had had other big moments in the match, saved the biggest moment for last. She will no doubt someday run for political office, so persuasive was her argument while the rest of the arena froze. Had she not spoken, it’s questionable whether Cooley would have made the case for himself, as no one was looking at him…except Kelsey Custenborder, who had presence of mind when no one else did. 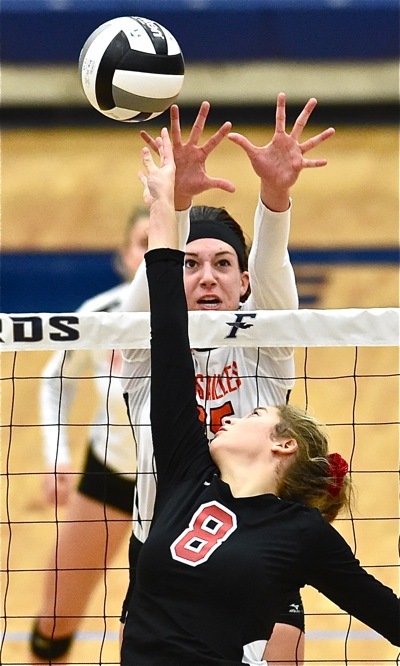 Stress at the net…between Versailles’ Lindsey Winner and Pleasant’s Laina Sansotta (#8). But no one had bigger senior moments on this day than Liz Ording, who led her team in kills, in senior presence, and in ‘CALM’. “I feel like a broken record when I talk about her,” said Bruggeman. “But she’s amazing. She’s seasoned, she’s such a hard worker and I rely on her so much. She was the one with the calm today, and she knows, too, that playing with the seniors she played with last year…she knows what needs to be done in situations. She knew what was going on with the other side, and she was so good to keep our side on even keel, because it was high intensity all day. The line judge clearly gave the signal…that the controversial point had been tipped. Ording was the coolest of all the cats, speaking of the title, and how they achieved it. They got ‘er done, despite the hiccups, the flubs, the streaks, and the mystery at the end. They got it done because a pair of seniors saved their best senior moments for when their backs were against the wall…and their season was at the brink of being over. So go ahead now, Kenzie. You get the last word. And let’s hope mistakes, miracles, and mysteries never cease. Custenborder (center) and teammates react when it finally sinks it…The Tigers are going back to State!